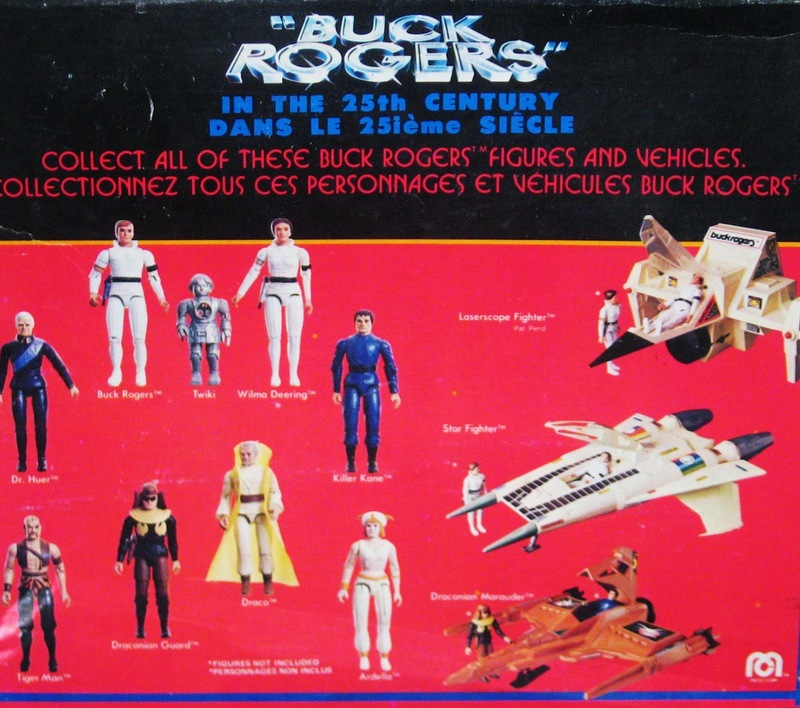 This is another Mego playset from the 1970s for which I harbor deep and abiding love. 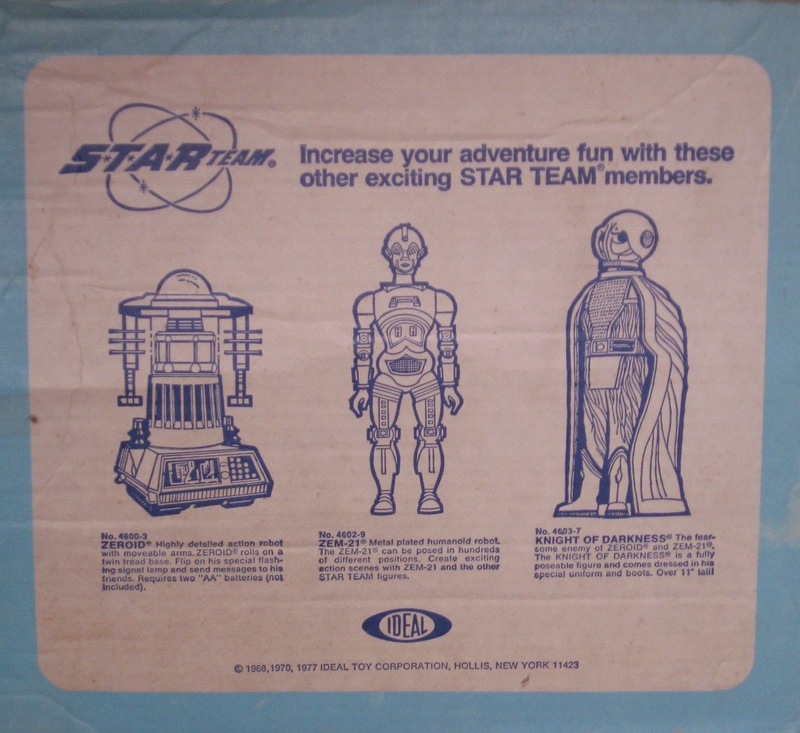 In 1977, Mego manufactured a line of toys from Flash Gordon (1936), including four 10-inch action figures (Flash Gordon, Ming the Merciless, Dale Arden and Dr. Zarkov), and this terrific playset/carrying case. 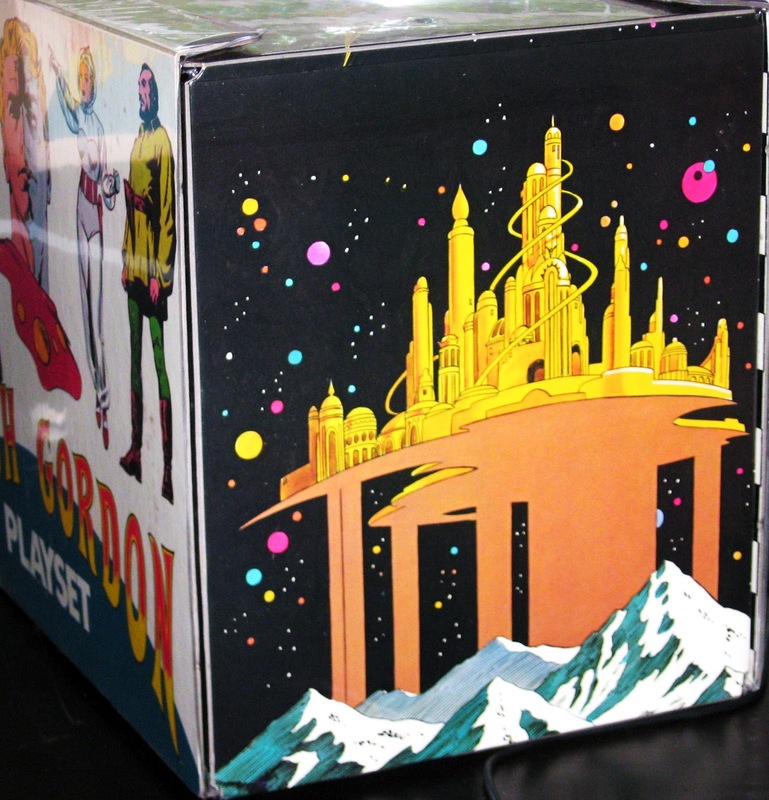 Like the Star Trek, Planet of the Apes and Wizard of Oz playsets, this Flash Gordon playset is constructed of hard cardboard, surrounded by laminated vinyl, I believe. The illustrations on this set are really quite beautiful as I hope you can see, and strongly evocative of Alex Raymond’s art work. 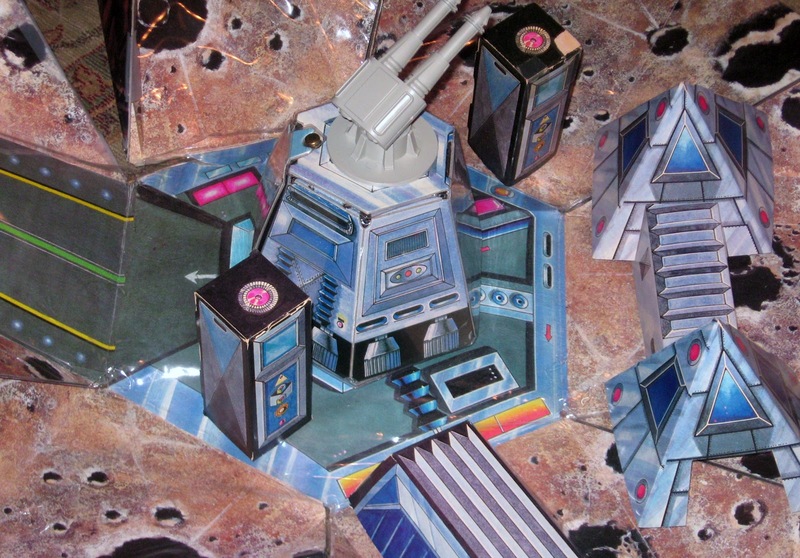 The three computer cards included here are double-sided, and feature images of all the characters, plus a city of Mongo, plus a rocket on approach. They slip down through the top of the computer, into the viewscreen. panel. You might think that the timing (the mid-1970s) was weird for a Flash Gordon boomlet but I remember in the mid-1970s — around the time of Star Wars — finally getting to see the original serial at my local library. On Friday afternoons, I think, I went to see it, one chapter at a time over a span of weeks. Also, if I’m not mistaken, some TV stations had begun to play the original Buster Crabbe serials as well. 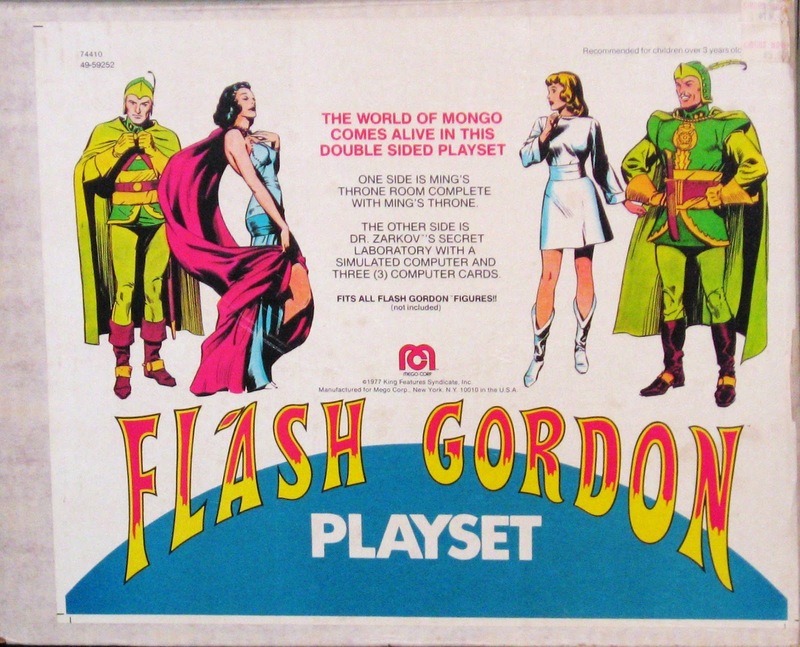 It was kind of a mini –Flash Gordon fad. My grandmother from Texas (now deceased), was thrilled to see the serials again because she had loved them as a kid. It was pretty awesome, actually, that my grandmother, mother and I could all sit down and discuss together Buster Crabbe and Flash Gordon. 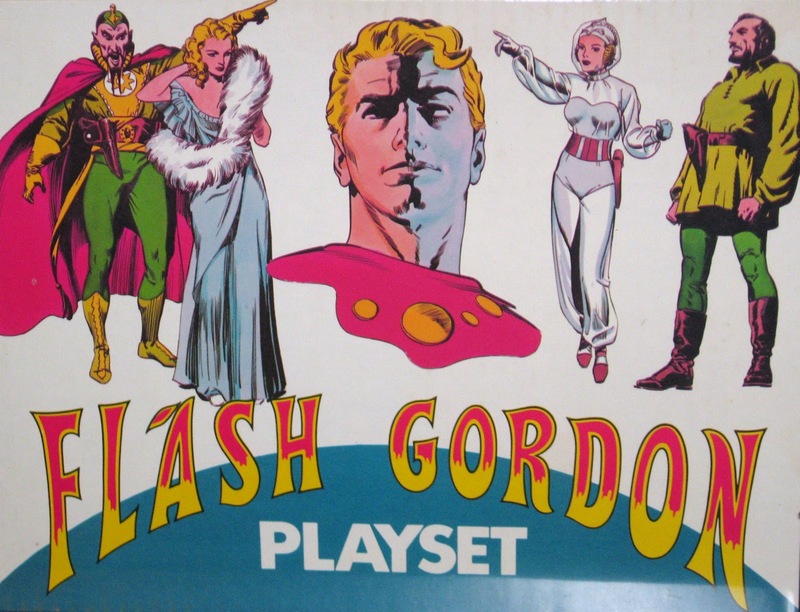 Today, I don’t own any of the Flash Gordon action figures, alas, which came equipped with plastic swords and cool helmets. 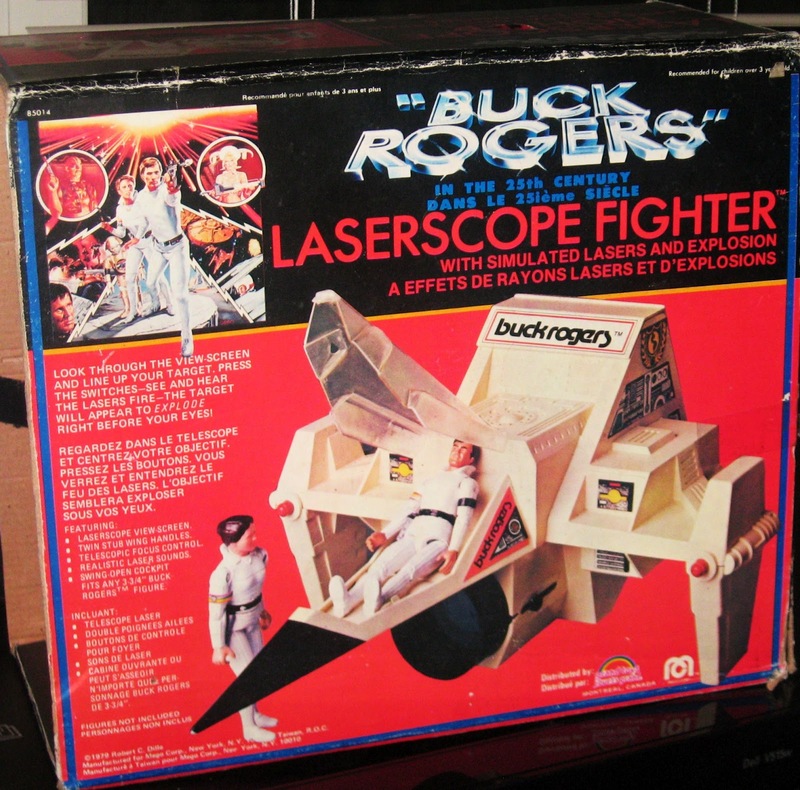 But I do own this wonderful Mego playset and its box, which remain in excellent shape. My five year old son absolutely loves transforming robots. Joel passionately collects Beast Wars, Gobots, Transformers, Megazords, Brave of the Sun Fighbird…you name it. Throughout our many travels in search of robots of all sizes and shapes, we often come across toys that we don’t entirely recognize. 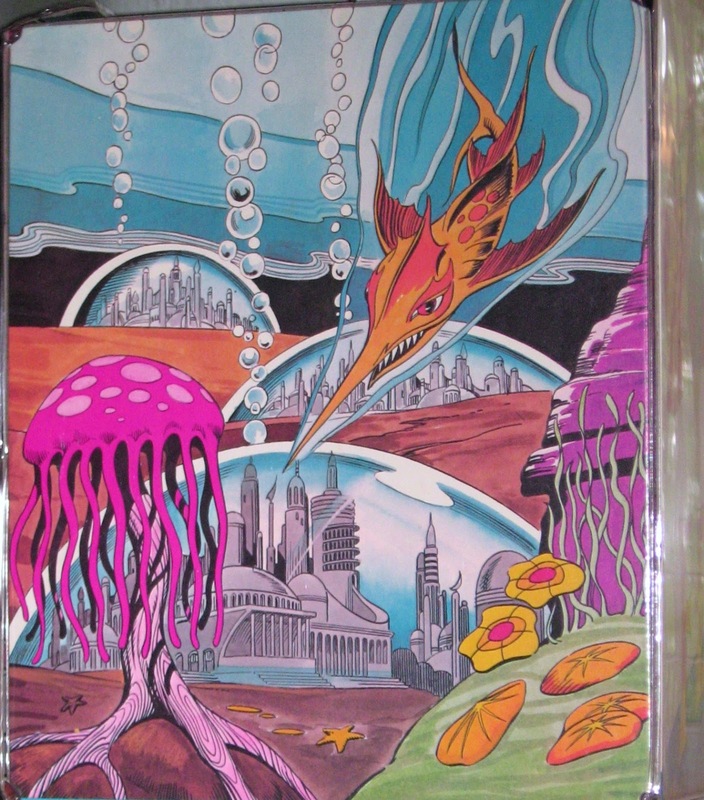 This week’s collectible is one of them. I must confess, I don’t know if this particular toy came from a popular Anime franchise or not. I’m not highly conversant in Anime, at least not yet. I’m learning. 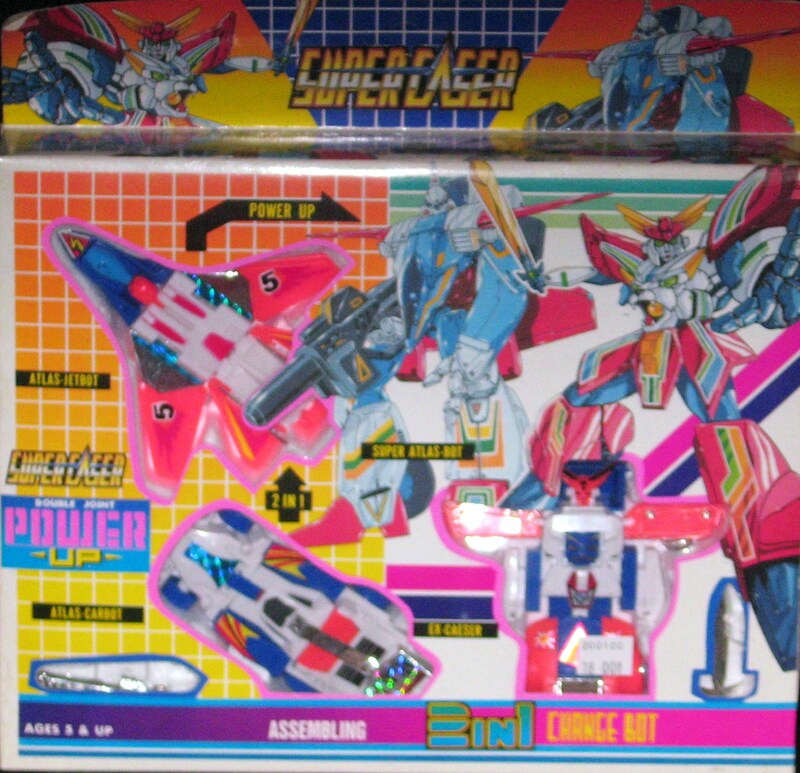 However, I believe this cool transforming robot set may have originated from something called “Video Senshi Laserion” in the 1980s, or “Super Laser” here in the States. Regardless, this “Assembling 2-in-1 Change Bot” with “double joint power up” transformation is a pretty awesome mechanical life form. 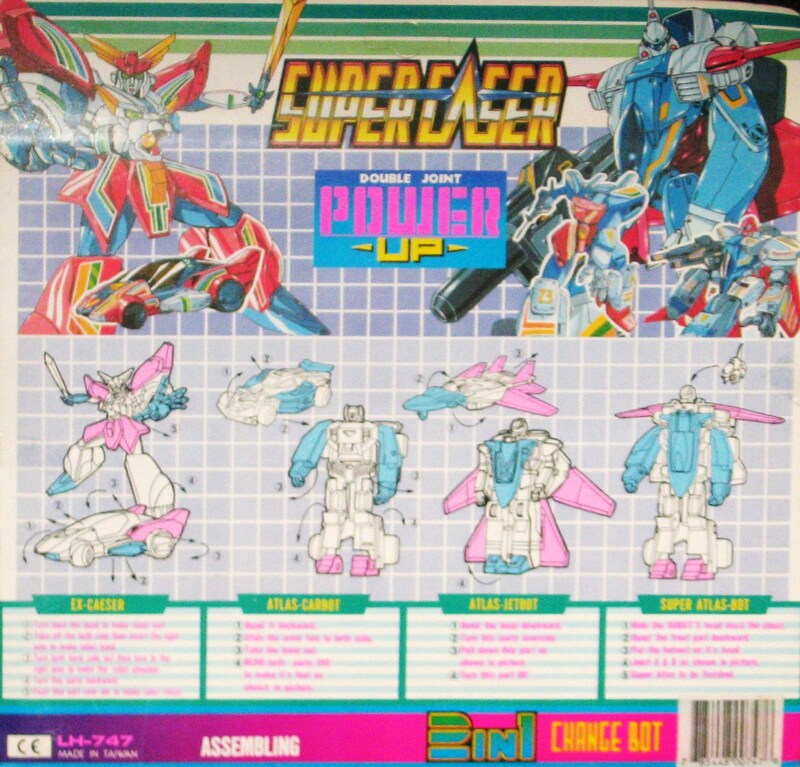 The toy was made in Taiwan, and three separate robots are included. 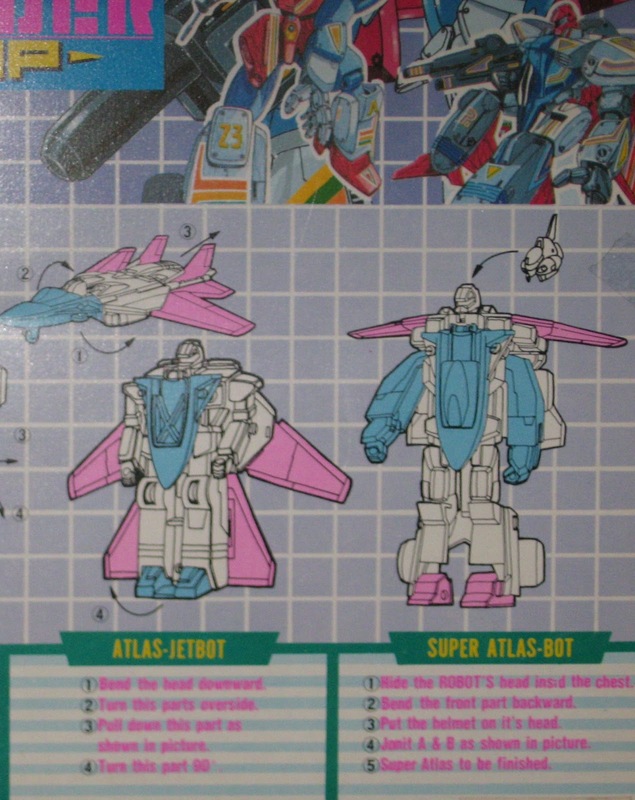 Individually, the robot consists of “Ex-Caesar” (a car), “Atlas Carbot,” and “Atlas-Jetbot.” Together, however, the machines make “Super Atlas-Bot,” and the back of the box provides detailed, step-by-step instructions for transforming the robots into cars and planes, and vice-versa. Not that Joel needs them. He’s far more coordinated at five than I was at that age, and he loves the thrill of discovering how to transform and combine robots. Just between you and me, he’s either going to be an engineer, or the world’s biggest fanboy. Or both. As much as Joel wants to get his hands on toys like the Super Laser Assembling 2-in-1 Change Bot and start playing, I’m a devoted fan of box art. Joel and I have an understanding: he gets the toys, and I get the boxes. It’s a good compromise, and when he’s done playing for the day, the toys go back in the box. Sure, they aren’t mint in box anymore — a phrase Joel has learned — but I realized a few years back that it’s more fun to play with these toys with my son than to keep them in boxes, on display. 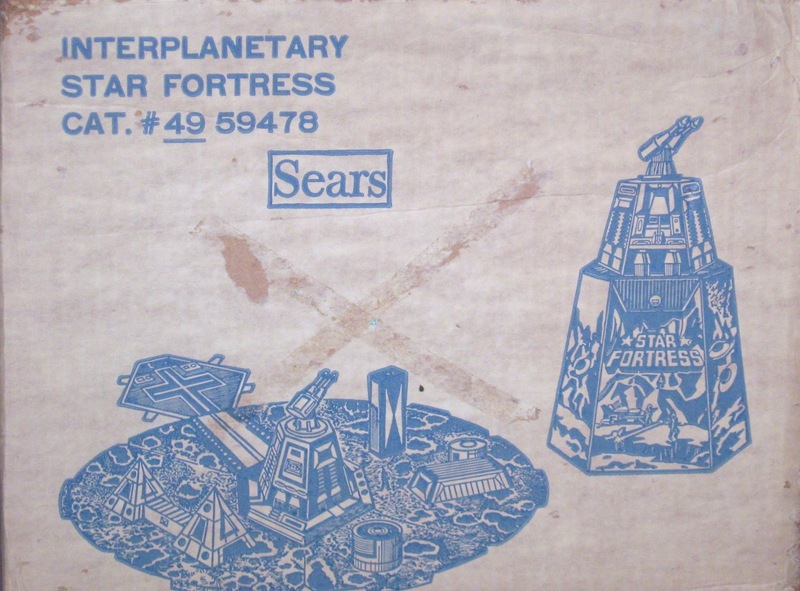 Back on November 30, 2011, I wrote here about one of my favorite StarWars knock-off toys, the fantastic “Interplanetary Star Fortress” manufactured and sold exclusively by Sears, and made to fit Kenner Star Wars figures, as well as Mego’s The Black Hole and Buck Rogers figures of the 1970s. 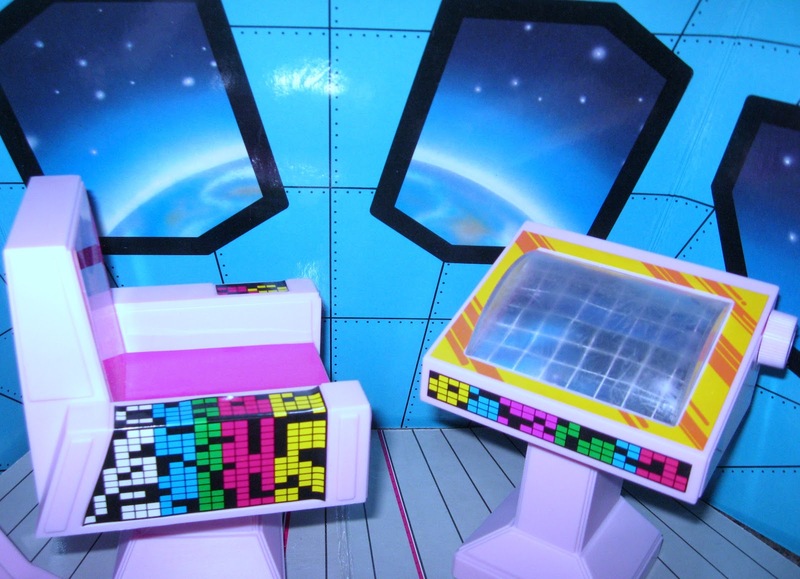 The playset is a quasi-cylindrical carrying-case that folds out to become an expansive asteroid surface and landing pad. 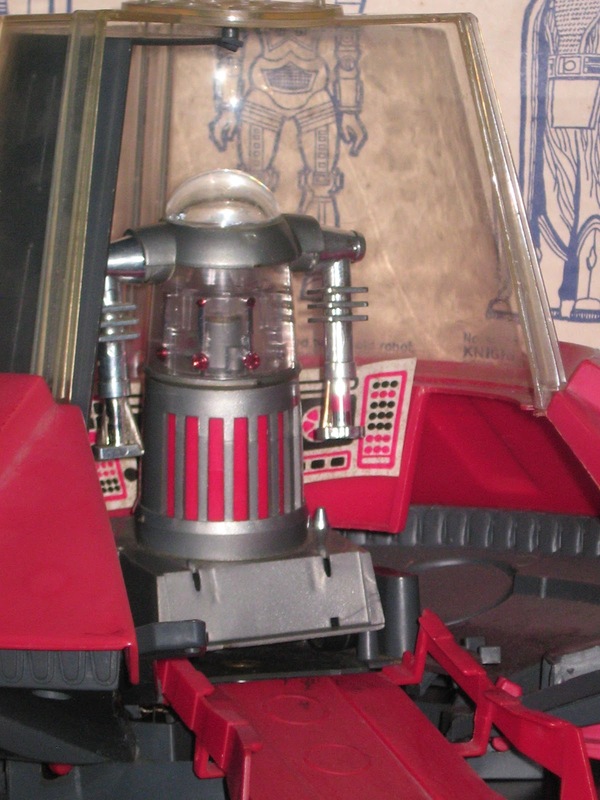 My own version of this disco-decade toy was missing several critical features, including a shuttle pod and plastic gun turret that could stand atop the cylinder. My version was also missing the carrying strap and the box. Joel and I actually got to fold the light cardboard “buildings” into shape, and connect them together with tabs, which was fun. 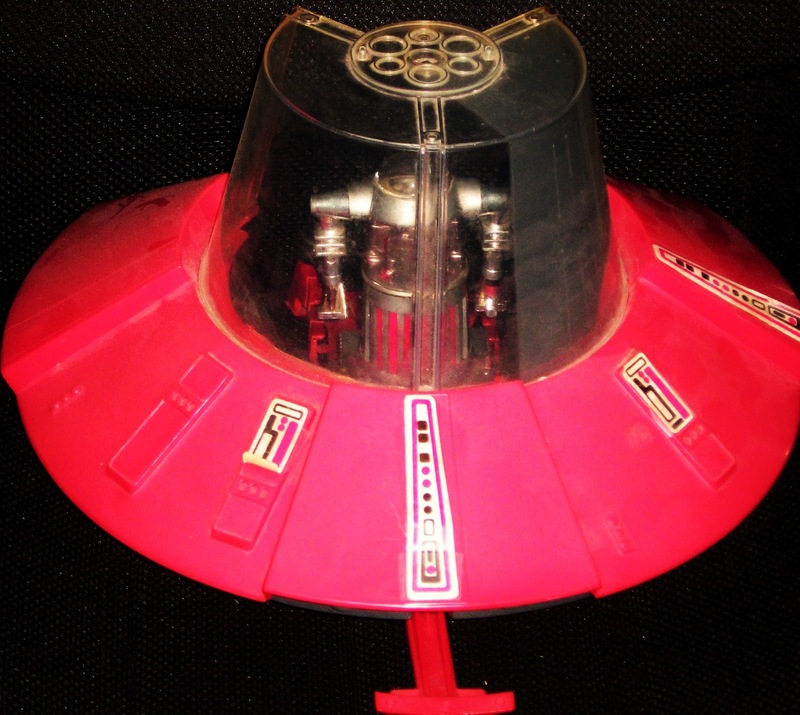 This knock-off is a much more interesting toy with the missing shuttle pod and turret intact, as well as the previously missing base structures. 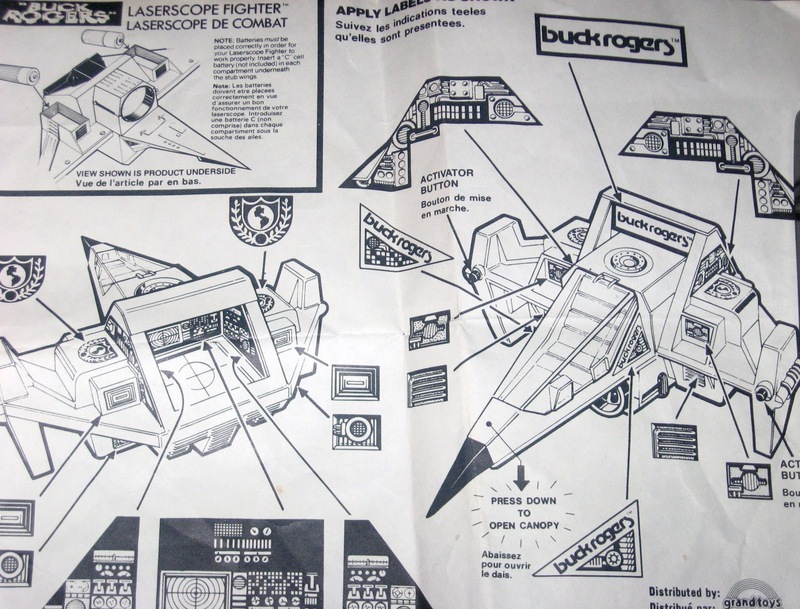 The shuttle pad actually has a door that opens, and snaps shut, and is fully decorated inside with high-tech (for the 1970s) imagery and detail. Yesterday, Joel and I used the newly up-fitted Interplanetary Star Fortress to stage a battle between Ben Tennyson and Ghost Freak (plus minions BenWolf and BenMummy). Not exactly the scenario I would have imagined at that age, but still a hell of a lot of fun. 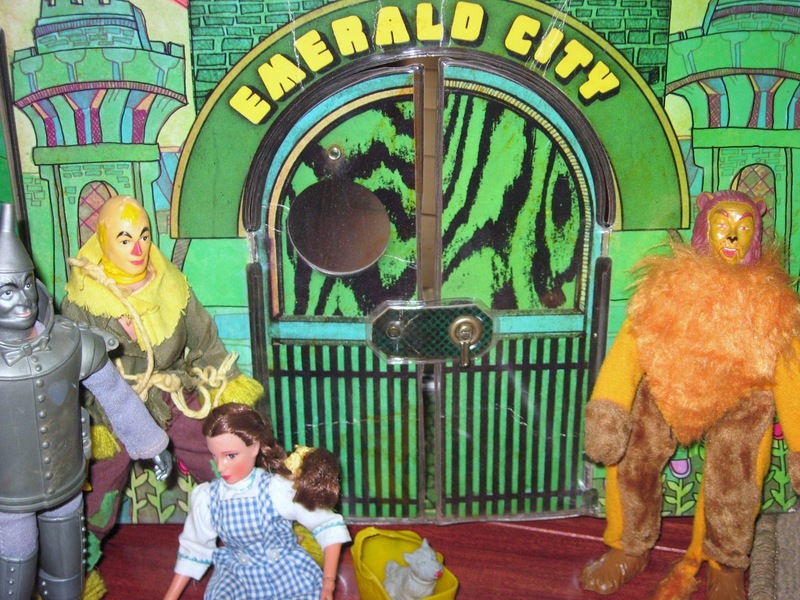 In the year 1975, Mego acquired the license from MGM to create playsets and action figures from the classic fantasy movie The Wizard of Oz (1939). 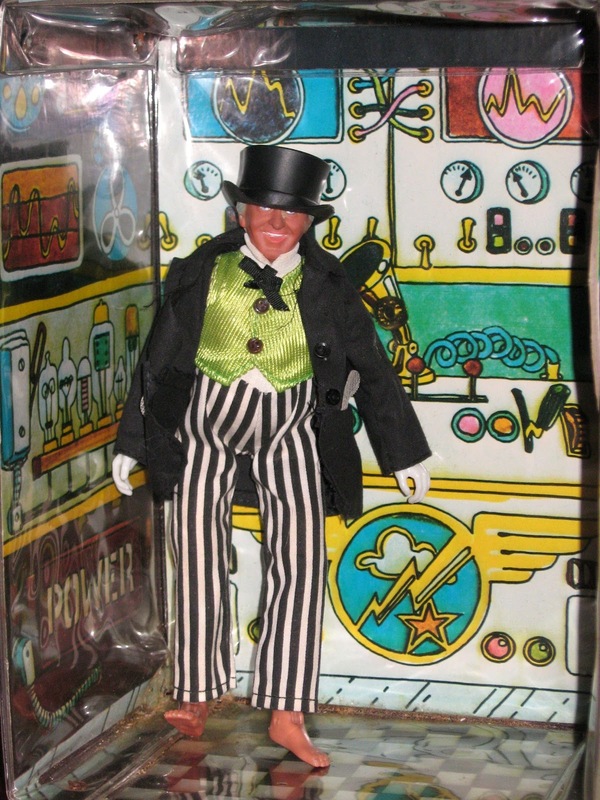 Accordingly, Mego released an impressive and varied line of Oz figures including Dorothy (w/Toto), the Scarecrow, the Tin Man, the Cowardly Lion, Glinda, The Wicked Witch, and the Wizard. Even a few munchkins, including the Mayor, were included in the roll-out. 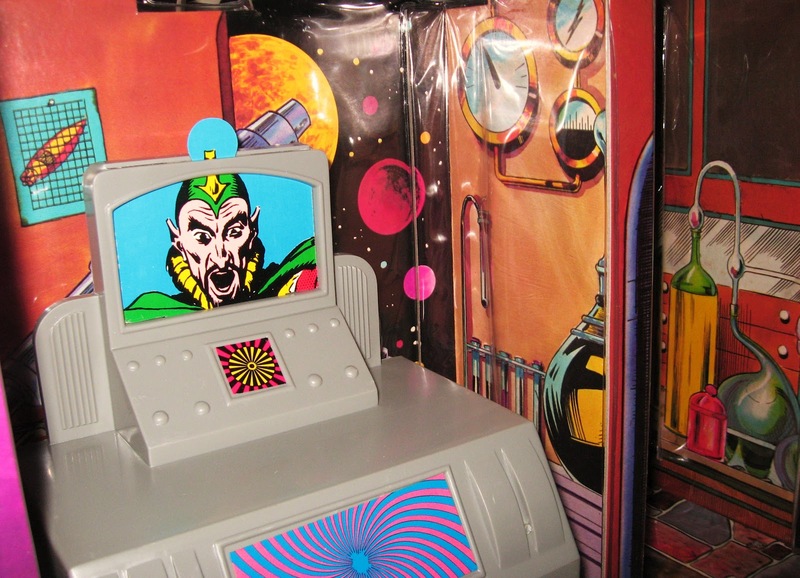 In terms of playsets, Mego manufactured a witch’s castle (which I’ve never seen, anywhere…), the mostly-movie-accurate Munchkinland and the piece de resistance, the Emerald City Playset. 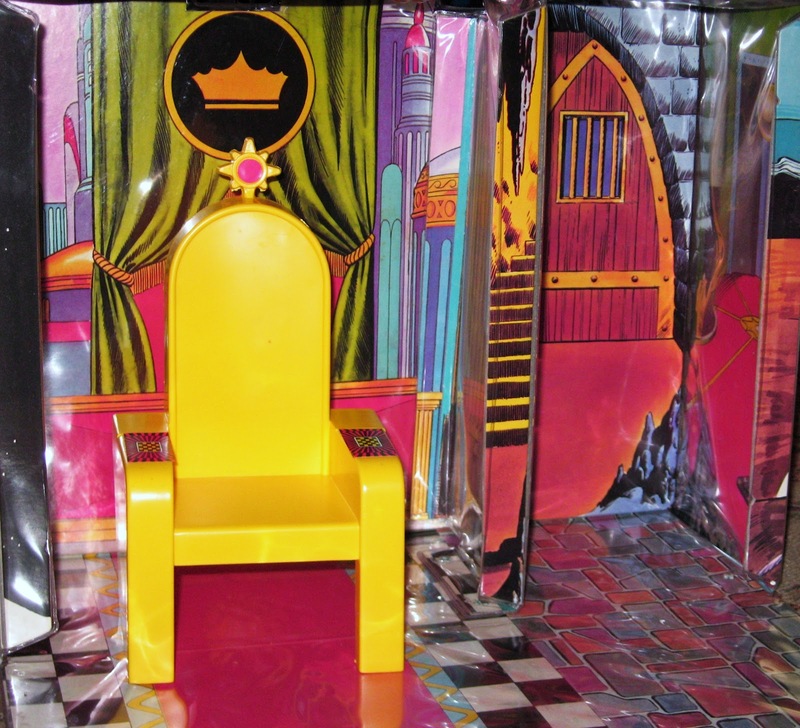 This huge, 42-inch playset could open up to reveal various chambers in th city, and came complete with a throne chair, a Wizard’s curtain, a removable/fold-able yellow brick road, and an 8-inch poseable Wizard figure. On the interior, you could see the booth where the Wizard worked his magic, and one window in the main chamber overlooked the poppy field. When I was a kid, The Wizard of Oz was a perennial, in terms of television reruns, and also had an unmatched reputation for scaring the little ones. I’m still terrified thinking of those talking trees, or the flying monkeys. 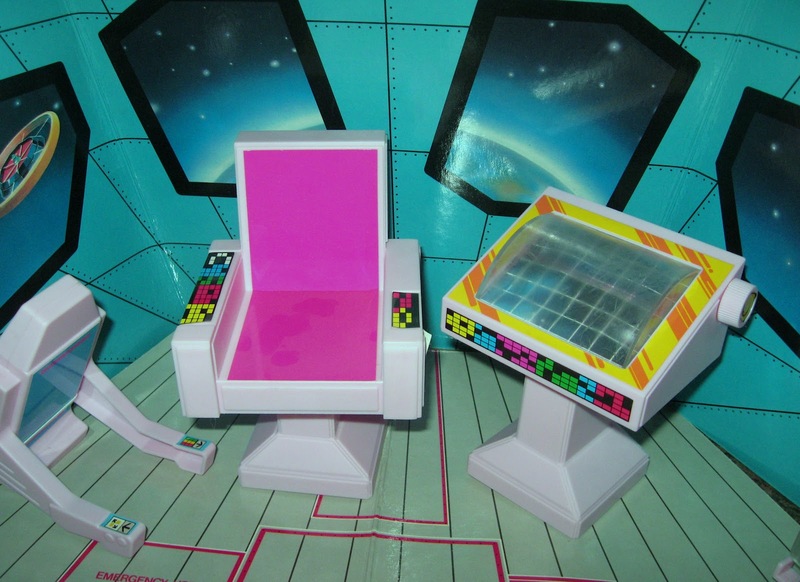 I do own this playset and a few of the Wizard of Oz figures, though neither is in great condition. Dorothy can’t quite stand-up anymore (no Judy Garfield jokes, please…), and the Scarecrow seems to have lost his hat, if not his brain. Also, my Emerald City is missing all its equipment, my pretties. 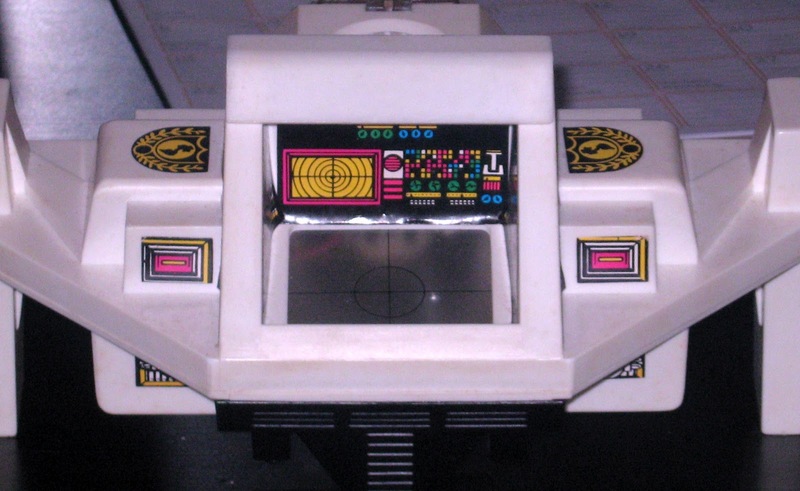 This toy reminds me a lot of the Mego Star Trek U.S.S. 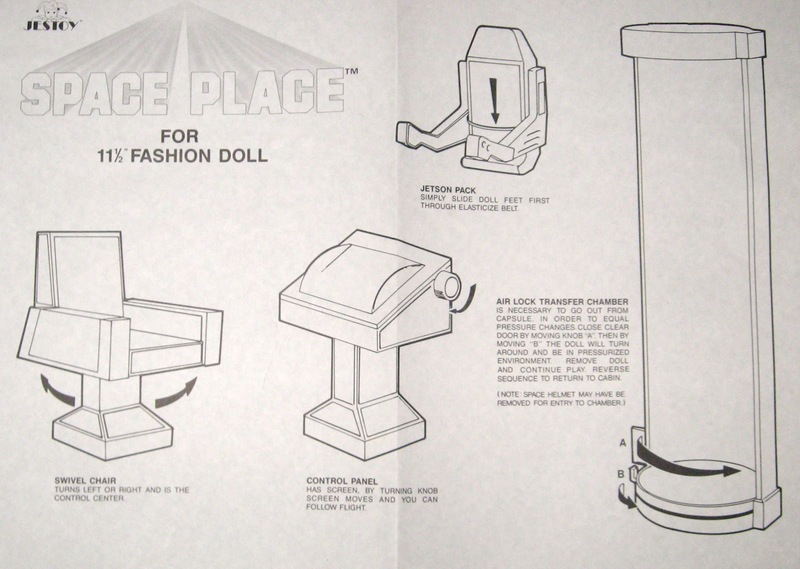 Entertprise Action Playset from the same era. It’s made of hard laminated cardboard and vinyl, and isn’t especially accurate in terms of detail. But it’s fun to play with, and I suppose that the appeal today is mostly one of nostalgia. 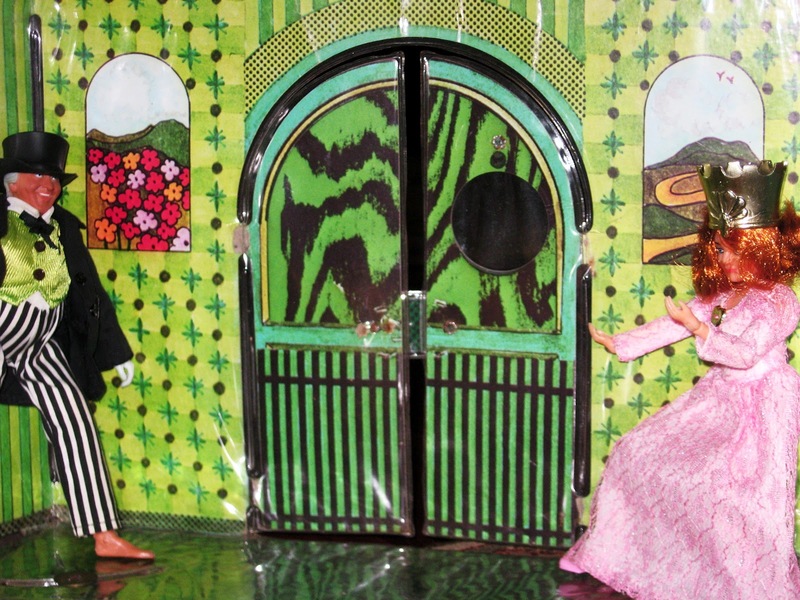 If you like this kind of Mego set, you’re sure to love the Emerald City Playset. 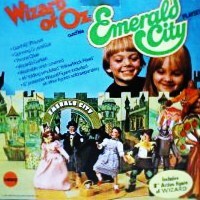 Below is a commercial from Mego, announcing the Wizard of Oz toy collection. It’s a blast from the past. Last week for the collectible of the week I remembered the Darth Vader-esque Knight of Darkness, from Ideal’s “Star Team” line in 1977. 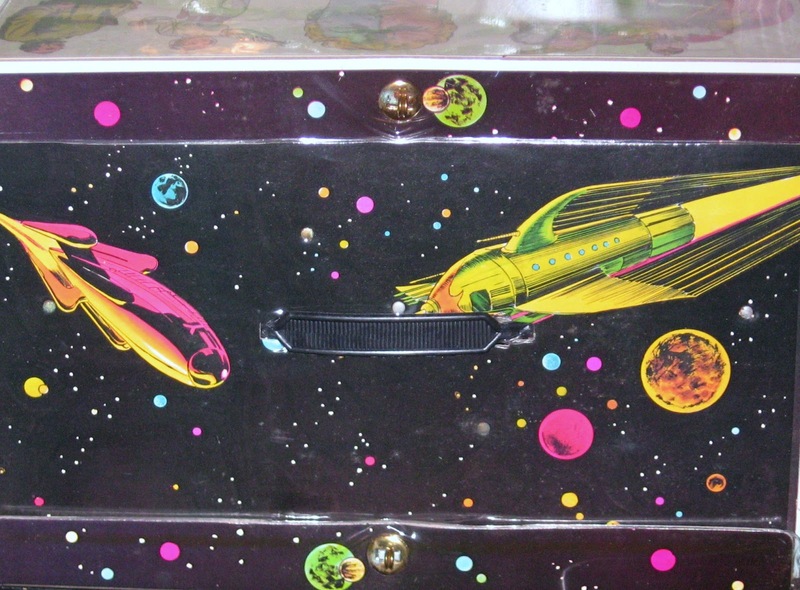 This week, I want to offer a closer look at another cool space toy in that same line (carefully labeled to include the copyright dates of both 1970 and 1977). 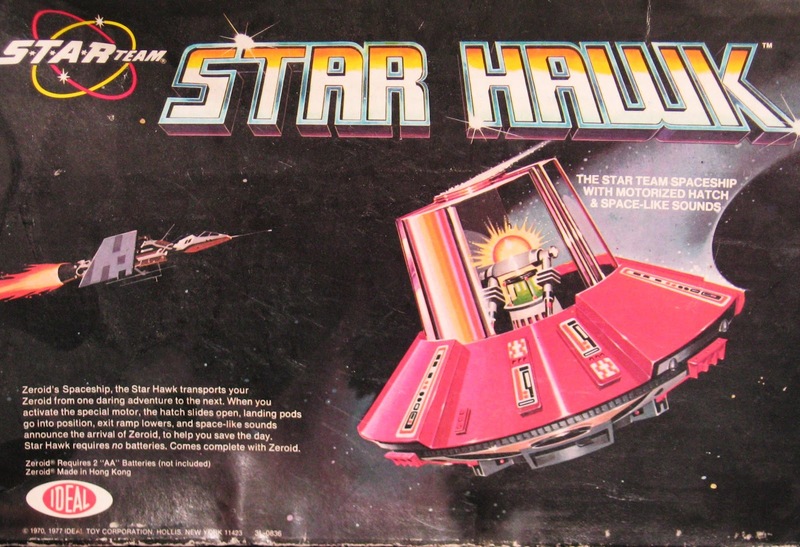 I wrote last week how my grandparents bought me the Star Hawk (w/Zeroid), the Knight of Darkness and ZEM-21, and at first I was disappointed with the generous gift because I would have preferred the Millennium Falcon, Darth Vader, R2-D2 and C3PO. 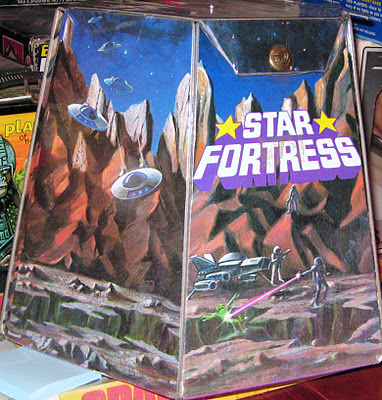 But it wasn’t long before I became intrigued by these Star Wars knock-off toys, and came to see that they allowed me to create my own play universe. In particular, I remember that the Knight of Darkness camped out in G.I. Joe’s Adventure Team Headquarters. 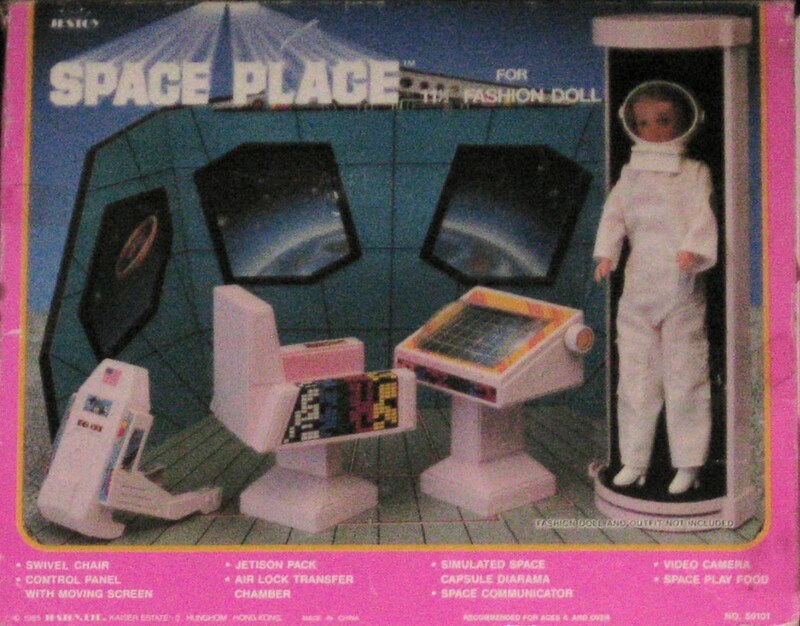 Today, I’m really glad I still have these particular toys in my home office. 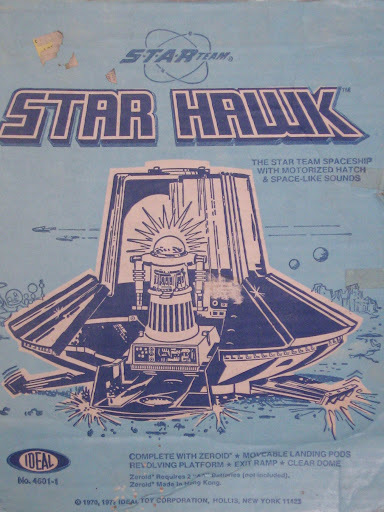 Even today, Zeroid’s dome lights up, and the Star Hawk hatch still slides open (with a springy rat-a-tat sound). 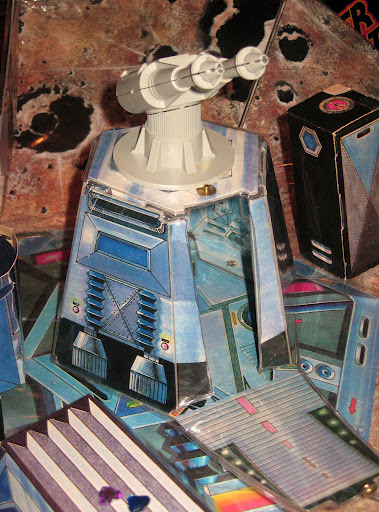 The decals are coming off now, after all these years, but these toys remain…ideal for the imagination. 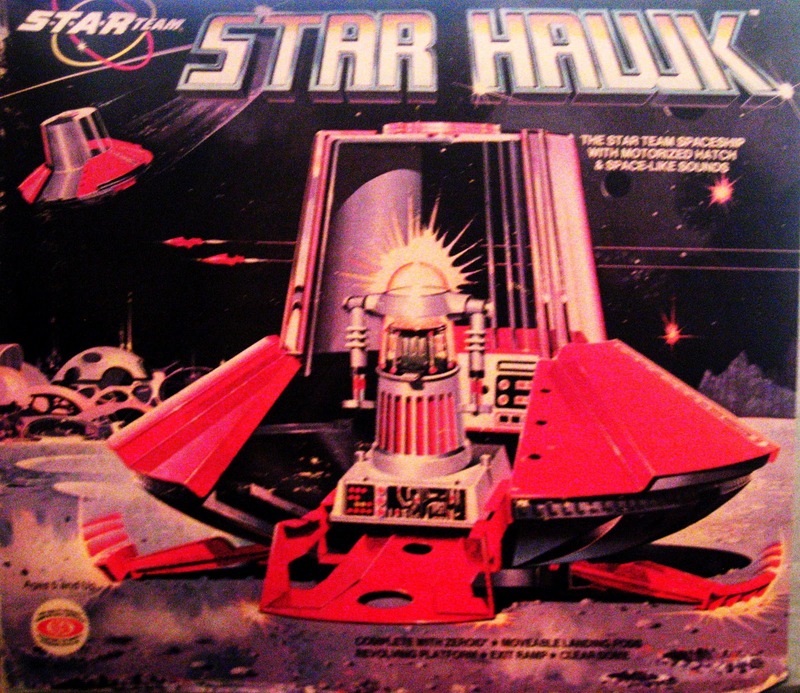 My son Joel loves them, particularly the Zeroid and his ship, the Star Hawk.